This classy and versatile bracelet surrounded on your wrist with round smoky topaz in prong-setting. Each stone size consists of 5.5 MM and the bracelet is 7 inches long with a lobster clasp. 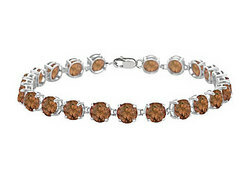 The entire bracelet is made in 14K white gold and has a total gem weight (TGW) of 12.00 carats.